I make this quite often for many reason. #1. Flavor. 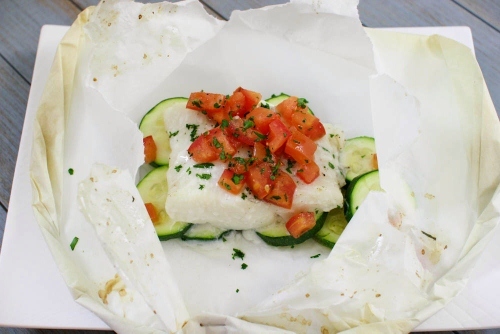 Baking the cod with aromatic vegetables and white wine infuses it with amazing, fresh flavors. Not only that, but the texture is phenomenal too. The fish is flaky, juicy and so tender. #2. Ease. 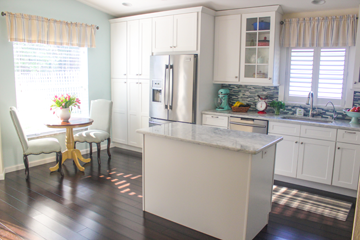 So simple to assemble, this meal cooks very quickly and cleanup is a breeze. #3. Health. It doesn’t get much more healthier than this way of cooking. And you will FEEL great after you eat it too. Thank you Cook’s Illustrated! Their recipes never let me down. 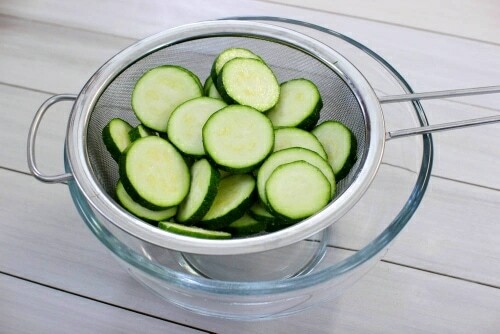 Toss the zucchini with 1/2 tsp of salt and set over a colander to drain for about half an hour. 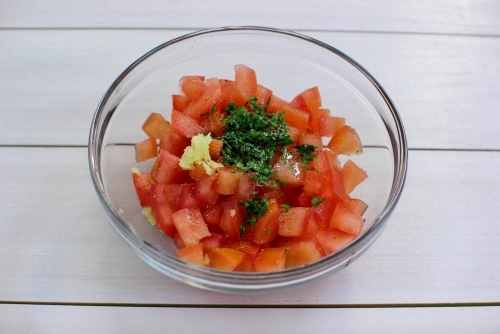 Meanwhile, combine the tomatoes, parsley, garlic in a small bowl and season with salt and pepper. Press the zucchini between paper towels to get out even more moisture. 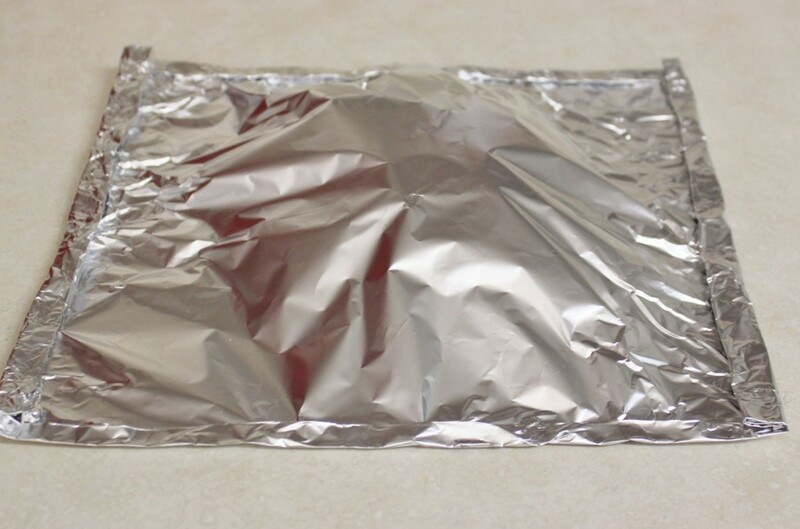 Place 1/4 of the zucchini, sightly overlapping, in the middle of a 10-12 inch piece of aluminum foil or a 20-24 inch piece of parchment paper. 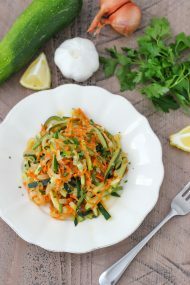 Pour 1 Tablespoon of white wine over the zucchini. Season the fish on both sides with salt and pepper. Place the fish on top of the zucchini. 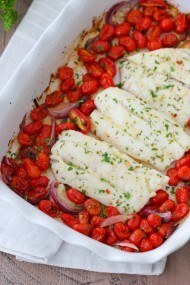 Top the fish fillets with the tomatoes. 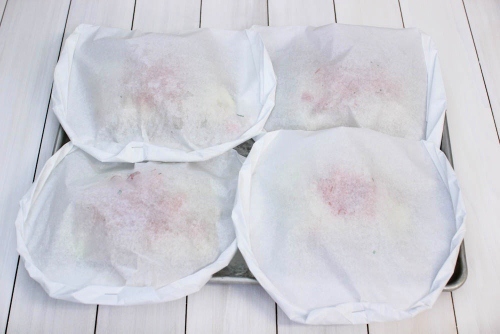 Place another piece of aluminum foil over the fish and create a packet, tightly sealing each side, or fold the parchment paper over the fish and fold the sides all the way around the fish, to seal the package tightly. I usually use a staple to hold the last piece in place. Repeat with the rest of the ingredients. You will have four packets of fish and veggies. Place on a rimmed baking sheet and bake for 15 min. It’s alright if the edges of the packets stick out of the baking sheet a bit. Open up the packets and serve. The aroma that meets you as you break open the packet is incredible. It’s really awesome to serve this to guests. Everyone has their own packet and they get to open it up at the table. 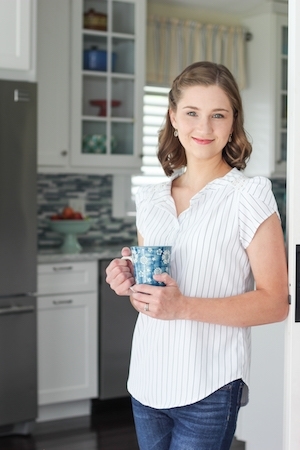 You can prep the dish completely and keep it in the refrigerator, until your guests arrive (or you are ready to make dinner for your family). Cook the fish 2-5 minutes longer, since it will be cold when it goes into the oven. 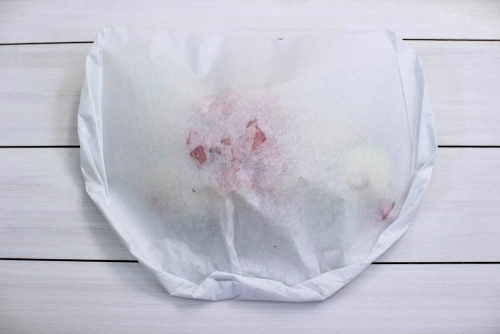 Place 1/4 of the zucchini, sightly overlapping in the middle of a 10-12 inch piece of aluminum foil, or a 20-24 inch piece of parchment paper. Place the fish on top of the zucchini. Top the fish fillet with the tomatoes. 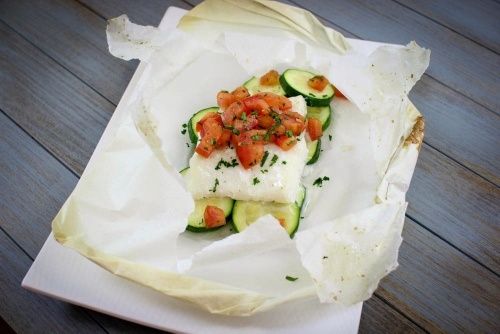 Place another piece of aluminum foil over the fish and create a packet, tightly sealing each side,or fold the parchment paper over the fish and fold the sides all the way around the fish, to seal the package tightly. I usually use a staple to hold the last piece in place. Repeat with the rest of the ingredients. You will have four packets of fish and veggies. 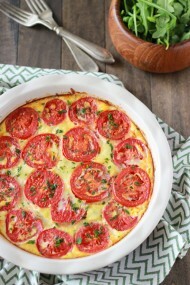 Place on a rimmed baking sheet and bake for 15 min. It’s alright if the edges of the packets stick out of the baking sheet a bit. Open up the packets and serve. 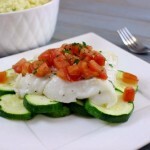 Hello the dish looks very yummy can you substitute the cod for tilapia fillet?? You can use any firm, fish that is not too thin. 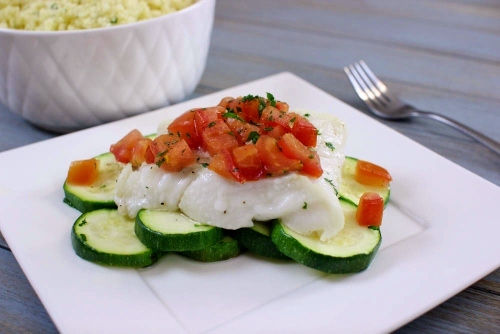 Tilapia will work just fine in this recipe. I made this dish with tilapia, and let me tell you it was delicious even next day as well. Hubby had leftovers and he was so shocked that the fish was still juicy and delicious! Thank you Olga for this awesome recipe! 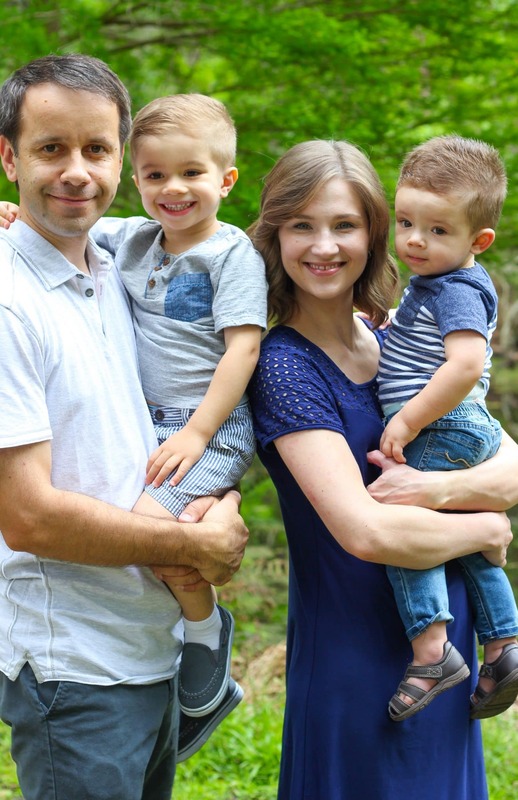 That’s awesome, Milana! I’m so glad you liked it. I like the leftovers too:). I made this today! Fish smells and taste very good! Thank you! Thank you Olga! I had only three ingredients in my house. 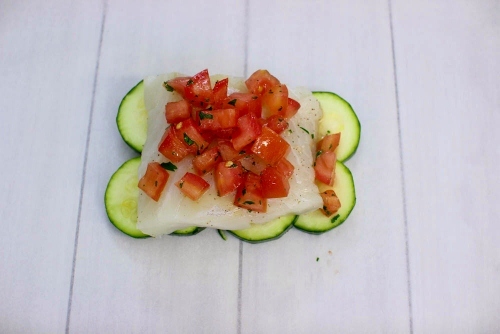 Some cod fillets in the freezer, some zucchini and a tomato. So I looked up those ingredients and found this recipe which was fabulous. And I think pretty healthy. And I do feel great after eating it! Thanks again, I will look for more of your recipes and tips. That’s great, Melissa! I’m so happy to hear that you enjoyed it. Thanks for taking the time to write. Olga – what can I substitute wine with in the recipe? Thank you! Vegetable broth or lemon juice, Katya.